Over fifty years ago, Dan and Elaine McSwain began a company with a vision to build the best possible homes in prime locations. With beginnings in Vidalia, Ga., the two placed an emphasis on homeowner satisfaction. As a family building homes for other families, they understood the importance of using quality materials and construction methods to build outstanding homes that would last a lifetime. Relocating the family business to Atlanta in 1985, the McSwains brought their reputation for integrity and quality with them – setting them apart from many other new home builders. Joining his parents in 1985, Keith McSwain began assisting his father as the family launched its presence in the Atlanta market. As their company continued to grow and expand, the original values remained – the McSwains remained passionate about always placing customers first. As the company continues to grow and expand, the name KM Homes pays tribute to its founders and its strong history of success. With an award-winning selection of finely crafted homes in the most desirable locations, KM Homes invites you to discover our passion as we strive for the future. Keith McSwain, a third generation builder, is the visionary behind KM Homes. A Vidalia, Georgia native, Keith sits behind the desk used by his grandfather over 50 years ago where the family tradition of homebuilding began. Early on, Keith showed drive and determination on the ball fields of South Georgia. 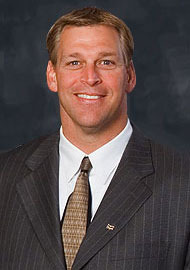 Upon graduation from high school, he continued a dream as a walk-on at the University of Georgia, which resulted in being a member of the 1980 National Championship Football team. His "don't quit" attitude pulled him through four years of injury plagued football as he earned his Bachelor's Degree. Keith poured that same principle into his work for the last 25 years and has proven to be an effective leader in the homebuilding industry. Not to rest on successes of the past, he has pulled together a team of choice professionals to work along side him in this endeavor. KM Homes desires to make the home buying and building experience an enjoyable one that will leave the new home owner pleased beyond their expectations. Keith and his team are committed to giving the best quality, value and service possible enabling memories to be made and passions to be pursued. All of this is possible because KM Homes has a "Passion for the Future." KM Homes has been building luxury new homes in Atlanta since arriving from Vidalia, Ga. in 1985. These luxury new homes are affordable with single-family homes starting from the mid $170,000s. When purchasing one of KM Homes’ luxury new homes in Atlanta, home buyers can expect the best of today’s interior features including hardwood floors, granite countertops, spacious master suites and much more. For those who enjoy the outdoors, amazing amenity packages can be found at every community. Amenity packages include community pools, tennis courts, sidewalks, playgrounds and cabanas. KM Homes' Atlanta communities are located in the most sought-after locations and provide close proximity to the best shopping, dining and entertainment in metro Atlanta. As one of Atlanta's most popular home builders, we know what our buyers need and want, and with KM Homes you get more than a luxury new home, you get a lifestyle. Stop by and visit one of our luxury new home Atlanta communities today! New Atlanta townhomes and single-family homes can be found with by visiting our Atlanta Communities Page .